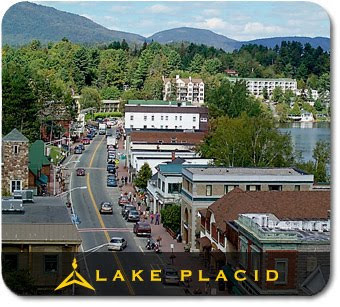 The Columbus Day weekend is traditionally one of the busiest in Lake Placid, New York's resort Village in the Adirondacks. Each year, for as long as I can remember, the local state-sponsored Olympic venue (site) manager, ORDA, hosts the Flaming Leaves Festival. The two-day Festival is held at the 1980 Olympic Ski Jumps and features the US Ski Jumping and Nordic Combined National Championships as well as food and music. Since there is no snow on the jumps yet, the jumpers glide and then land on wet plastic and try very hard not to fall since plastic burn hurts very badly. Since Nordic Combined means the competitors ski jump and cross-country ski, the ski aspect of the race is conducted on pavement using roller skis. This weekend is when our Canadian neighbors celebrate Thanksgiving, so the Village is packed with visitors from Canada and the United State taking advantage of the three-day weekend. The leaves are stunning and the bugs are non-existent, so the hiking is superb. Needless to say, owners of vacation rental properties looking for a return on their investment love this time of year in the Adirondacks.